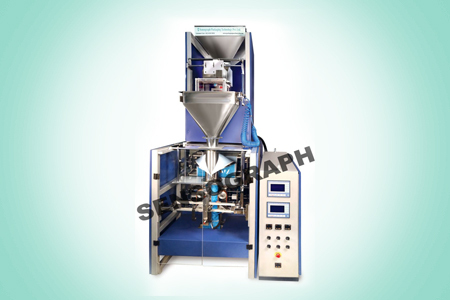 The material feeding system is weighmatric means it feeds the material to the pouch by weighing. The actual weight of the material is displayed on the 5” display provided on the front panel. The roll feeding is made easy in this machine. The quick changeover of ‘Collar’ makes it useful for medium and large scale packing requirement where frequent change of material & pack size is essential. Best suited for packing of Irregular shaped products such as potato chips, extruded food, banana chips, cheese balls, bakery products, homogenous fine grained products such as tea powder, seeds, sugar, whole spices etc.